One of my favorite 'Wacky Washington' Pictures from my Woodley Park book, co-written with Gregory J. Alexander. In August of 1973, National Zoo staff members take a welcome plunge in the 171,000 gallon polar bear exhibit pool. Lucky for them, the bears wouldn't arrive for two more weeks. Many summer visitors to Rock Creek Park are surprised to find a log cabin along Beach Drive at the overpass of Military Road, and few are likely to know that it was once the home of poet Joaquin Miller (1837-1913). It was moved there the year of his death from its prior location just east of the cascade in Meridian Hill Park when it was threatened with demolition. 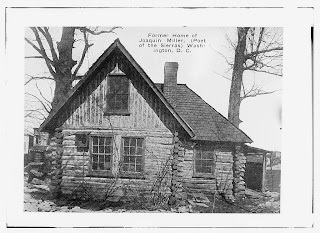 Miller would later be well known in international literary circles, and had built the cabin here in 1893 when he had moved to Washington with political ambitions that ultimately failed. In fact, much of his background and life experiences that he wrote about were apparently wild fabrications. 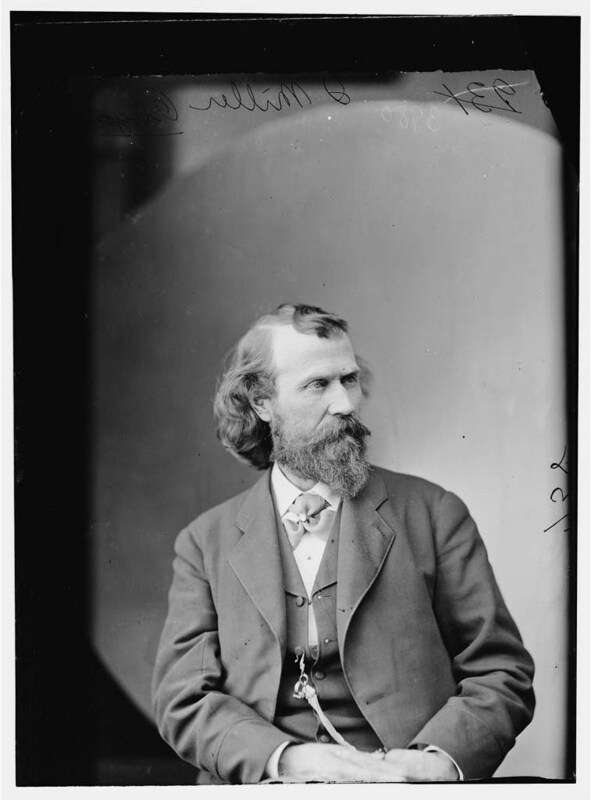 Known as the “Poet of the Sierras," Joaquin Miller was perhaps best known for his poem Columbus. 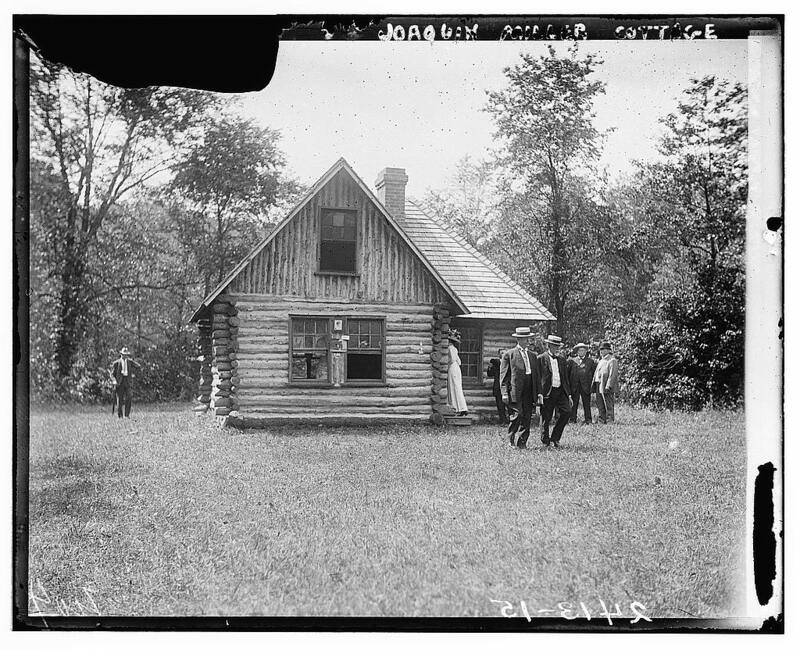 His cabin stood along 16th Street for 30 years until threatened with demolition as the new park was being planned. He is quoted as saying, "I sit up here in my fine cabin, while the President himself sits down there at the end of the street with his little cabinet." 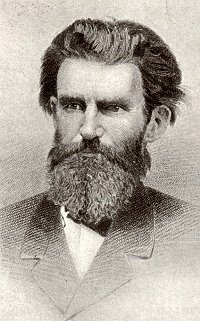 Miller’s creative writing began with his assumed name; his real name was Cincinnatus Heiner (or Hiner) Miller, who had been born on September 8, 1837, a date that also frequently changed during his lifetime. The name "Joaquin" was adapted later from the legendary California bandit, Joaquin Murietta. Born to Quakers in Indiana, the family moved to Oregon and settled on a small farm. His often cited exploits included a variety of occupations, from mining-camp cook, lawyer, judge, newspaper owner and writer, Pony Express rider, and horse thief. As a young man, he moved to northern California during the Gold Rush, and apparently had a variety of adventures, including a year living in a Native American village and being wounded in a battle with Native Americans. A number of his works, Life Among the Modocs, An Elk Hunt, and The Battle of Castle Crags, draw on these alleged experiences. The well respected “Bradbury piano” is familiar to generations of pianists and musicians beginning with its unveiling in 1861 in New York. The influence of the company and its profitability spread rapidly, and a showroom for the many varieties and models of Bradbury’s opened in Washington in 1877. 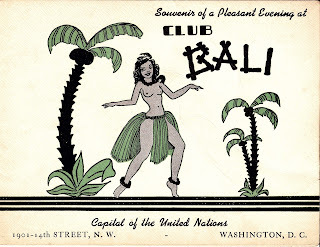 Located at 1225 Pennsylvania Avenue and owned by Freeborn G. Smith, the building featured a plethora of advertising signs, and was managed for decades by a Dupont Circle resident in the 1700 block of Q Street by the (great) name of William Van Wickle. The Bradbury piano was the brainchild of noted hymn singer and church music composer William Batchelder Bradbury, who strived to combine the traditional tone of the organ with the mechanics of a standard piano. His vision became a reality with the production of the “Bradbury” piano in 1854. And, like any good businessman of today, Bradbury cashed in and sold the business shortly thereafter, in 1867, to investor Freeborn Garrettson Smith, but died just a year later. Smith’s Washington’s showroom opened just ten years later, in 1877. By 1903, Bradbury pianos were being mass produced with impressive quality, and sold in showrooms that Smith owned in eighteen cities nationwide. 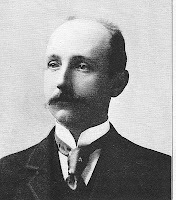 The long time manager of Washington’s F.G. Smith Piano Company was Dupont Circle resident William Perrine Van Wickle, who resided at 1757 Q Street, NW. Pictured above, it was later replaced by a modern townhouse, but had looked like its neighbor at 1759 Q Street, a brown stone house also seen above). Van Wickle was born in November of 1856 in Lyons, New York, and received his education at Palmyra (NY) Classical School, and at the Troy New York Academy. He went to New York City in 1876 and worked for the Bradbury Piano Factory as a shipping clerk and later in the repairs department and general offices. In 1878, he opened a branch piano warehouse in Brooklyn and another in Jersey City, in August 1879. Another quick post today from my Washington Then & Now book, where we tried to put a contemporary spin on a vintage photograph by recreating it with modern people. In the image below, we see a picture of Warwick's Cafe on 13th Street near Pennsylvania Avenue. 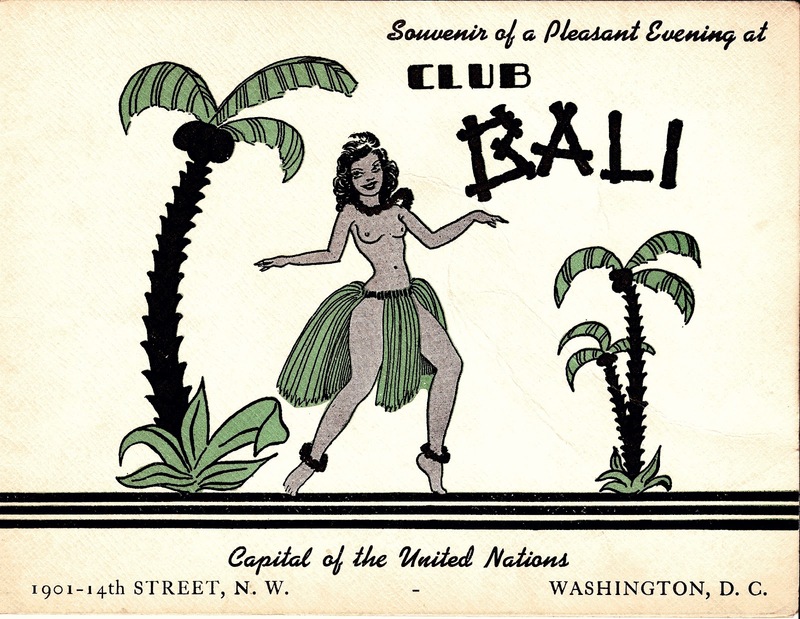 An advertisement from 1894 described at as "an importer of choice wines, liquors, and cigars...a gentleman's resort with the best of service." Mention the phrase "gentleman's resort" today and you might have the gay bar Jr's Bar and Grill come to mind. Located at Church Street and 17th Street, NW, its been around for more than 25 years. In 2002, co-author T. Luke Young and I visited, where we photographed employees on an early afternoon before opening. Shown from left is bartender Matt Henry, Brad Lamm, Paul Williams, David Perruzza, and two unidentified liquor salesman that recall the Warwick cafe itself. 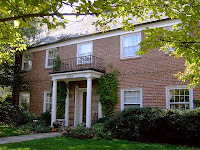 The large house at 1252 Maryland Avenue was built in 1892-1893, but is perhaps best known as the location of the Washington Junior College of Music and Education beginning in 1947; and the granddaughter of its founder, Andrea Kelly, still resides there to this day. She commissioned us to do a house history in 2002 and provided the historical photographs seen on this page: we promised to bring a bit more documented history of the school and its various locations in and around Washington, DC. We love a good mystery! John H. Buscher received a permit on September 28, 1892 for the construction of 19 homes including the largest of the lot, 1252 Maryland Avenue, NE. The homes were designed by architect Appleton Prentiss Clark Jr. (1865-1955) and built by Henry Getz, who lived close by at 634 10th Street, NE. 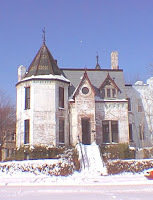 Owner/developer John Buscher lived at 928 Maryland Avenue, NE, but would move into 1252 Maryland Avenue with his family when the houses were completed in the spring of 1893. 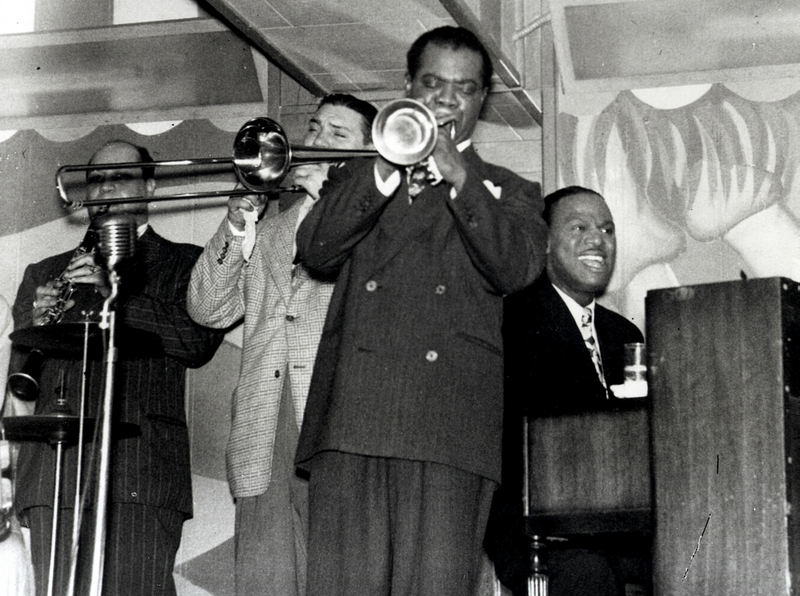 James Eubanks and his band students, undated image. Later owners William and Jeannie Calomiris sold 1252 Maryland Avenue on September 16, 1947 to James E. and Gustavia Eubanks for $15,000. Just two years later, the Washington Pittsburgh Courier carried a story about the pioneering young couple and their Washington Junior College of Music and Education. It explains the origins of the academy and the previous locations of the institution. The article also refers to the fact that James Eubanks was a graduate of Frelinghuysen University of this city, an education institution started by Jesse Lawson and well known African American educator Anna Julia Cooper in 1907. From 1921 to 1926 they maintained a house at 1800 Vermont Avenue as classrooms (that I had purchased myself in 1992), and later met at Cooper’s own house at 201 T Street when racial pressures and legal discrimination of the era prevented it from owning property in the city or elsewhere. 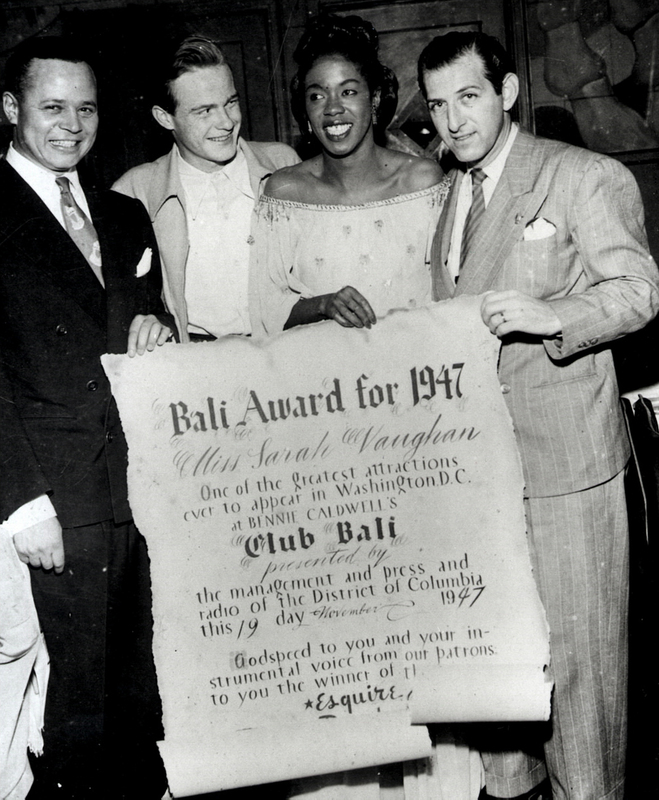 James and Gustavia Eubanks and Miss W. A. Davis, 1949. The Washington Junior College of Music and Education operated for many years out of 1252 Maryland Avenue. 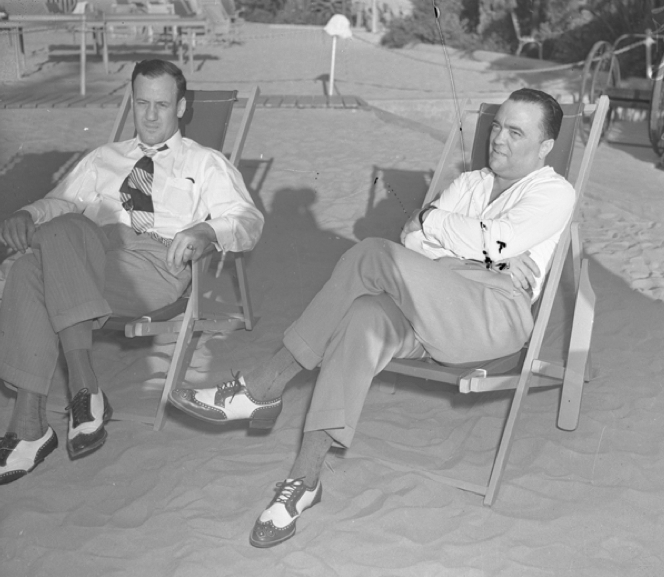 The 1949 newspaper account indicated that at the time, they maintained an impressive 12 pianos and 1 organ at the property, on which 200 students were taught from kindergarten age to college graduates. 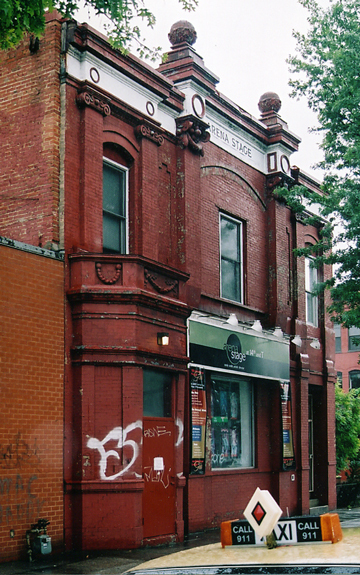 The school had its origins at 656 12th Street, NE., in 1930, when pioneering pianist James Eubanks expanded a teaching studio into a full-fledged school. 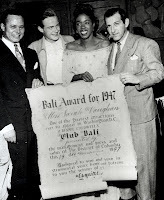 He had decided in 1928 to forego law and culture studies, having been a graduate of Frelinghuysen University, Temple University School of Music, and the Von Unschuld University of Music in Washington. Students at the 656 12th Street, SE location are pictured at right. Most homeowners with nineteenth century houses in Washington, DC would believe that their house was the first one built on the lot, but as if often the case, they are mistaken. 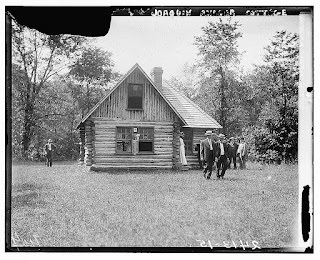 Many wood frame houses dotted the landscape in the early to mid 1800s, and were subsequently razed, burned, or moved to other locations as land became more valuable and the population increased dramatically in the city following the Civil War. 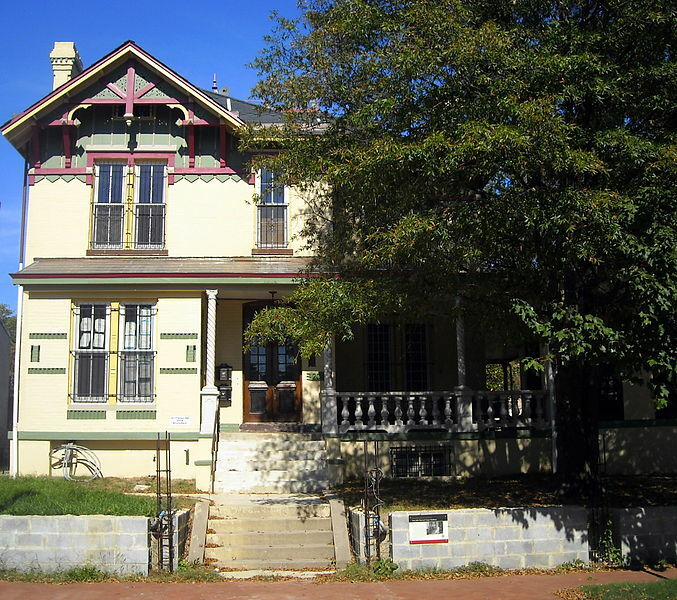 The grand house at 712 East Capitol Street, NE is one such example. Owner and builder Antonio Malnati applied for and was granted building permit No. 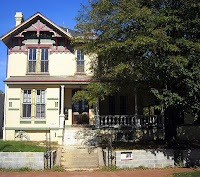 222 on August 2, 1902 for the construction of the house that today stands at 712 East Capitol Street. He had purchased the site in April of that year, and razed a rather substantial wood frame house that had belonged to General John Eaton and had been built before 1873. Malnati listed himself on the permit as responsible for its construction, and architect George S. Cooper as responsible for its design. He estimated that the cost of construction was about $10,000, a substantial sum for the time. The first house at the address, however, built in the early 1870s, had belonged to John Eaton, originally from New Hampshire, who resided there with his wife until 902, when it was razed to make way for the present house. The John Eaton School at 34th and Lowell Streets in Cleveland Park is named after this early city resident - it was built in 1910 to the designs of architect Appleton P. Clark and was dedicated on November 23rd of that year. More on Eaton below. The Eaton house was razed in the summer of 1902 for the construction of the large brick and stone residence seen today at 712 East Capitol Street. 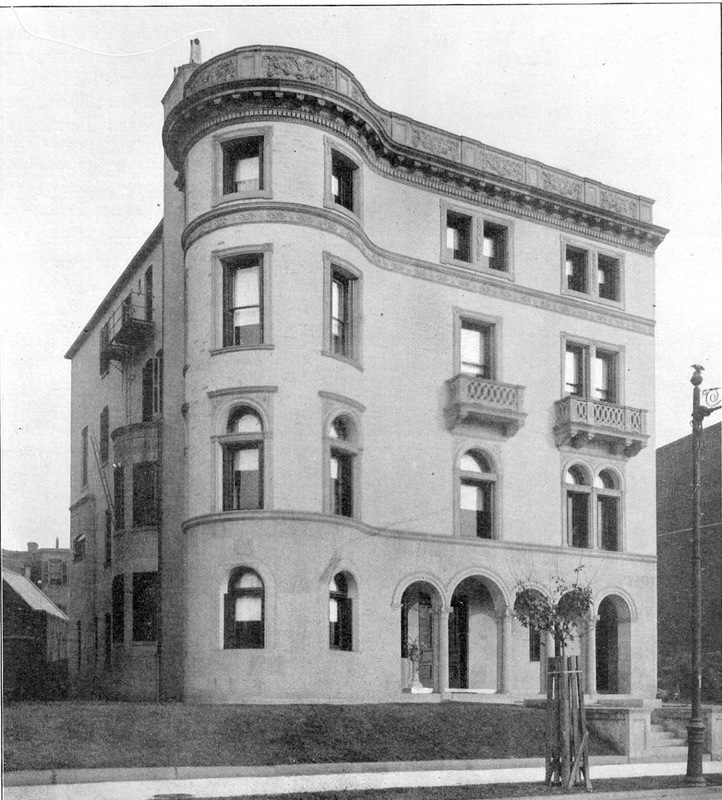 It can be assumed that construction of the new house was completed by the spring of 1903, when the Malnatis would have moved into their fine home on three lots from 818 East Capitol Street, where they resided earlier. Unfortunately, Antonio Malnati (whose name incorrectly appears in many publications as spelled Malmati) would only enjoy his grand home for four years; he died of heart failure in 1906. However, the house was lived in by his wife Lena, and was kept in the family until his daughter Antoinette and her husband sold it in 1960. Malnati had been born in September of 1845 near Milan, Italy, and immigrated to the US in 1869; Prior to his coming to America, he traveled and worked as a stone cutter through Germany, Switzerland, and France, eventually landing in Baltimore, MD on July 2, 1869. He worked there until 1872, and worked briefly in Richmond, where he became a naturalized citizen in 1876, before coming to Washington, DC to work as a stone cutter on the State, War, & Navy Building (today’s Old Executive Office Building). 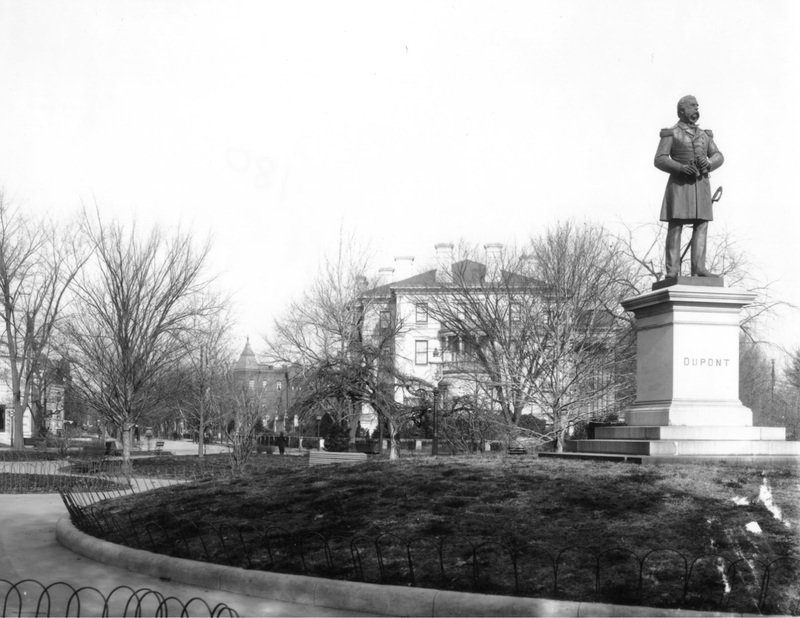 Most Washington residents correctly assume that Dupont Circle is named after the famous chemical and industrial du Pont family, but few may few know that its central white marble fountain was not the first statuary object to commemorate a member of that prestigious family, Admiral Samuel Francis du Pont. 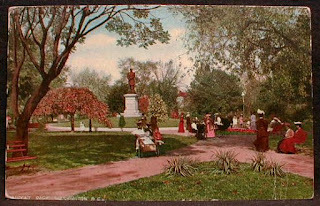 Before 1882, Dupont Circle was referred to as Pacific Circle, a name designation instituted by city planner Charles L’Enfant. On February 25th of that year, the U.S. Congress officially designated it as Dupont Circle, and within the following two decades, large and lavish homes began to appear around its perimeter, having been developed far later than Logan Circle. Dupont Circle itself was landscaped with lush plantings, 850 ornamental trees, and exotic flowering species, and in 1884, a bronze statue of Admiral Samuel F. Dupont was placed atop a granite base at its center. It was sculpted by artist Launt Thompson. Samuel du Pont was born in 1803, and had become involved in military affairs at the young age of 12, when he was appointed to the U.S. Navy by President Madison. Following an impressive military career that took place all over the world, he was appointed Rear Admiral on July 16, 1862. Toward the close of the year several armored vessels were added to his command, mostly of the monitor type. Being the first officer to whom the monitors had been assigned, he carefully tested their offensive powers, hampered by their small number of their guns and the slowness of their fire. On April 7, 1863, du Pont led a charge to take Charleston, South Carolina. His gallant effort had failed miserably, however, with limited maneuverability in the channels, one ship sinking and five others being disabled. Du Pont had beforehand given an opinion that a ground force was necessary, but had been rebuffed by the Navy. His last military action seemed to tarnish his lifelong career, and Charleston only fell on the approach of Sherman's army. Du Pont died in Philadelphia, Pennsylvania, on June 23, 1865. To honor him and help set the record straight, the du Pont family erected a statue of Samuel in 1884, but today, the statue is nowhere to be found in Washington. That's because in 1922, the du Pont family had the statue relocated to Wilmington, Delaware where it can be found in Rockford Park. Many residents and tourists alike that stroll up and down Connecticut Avenue north of Dupont Circle pay little attention to the architecture above the first floor retail space. However, if one pays close attention to the architecture preserved on the upper floors, it is revealed that the majority of the buildings lining the commercial corridor today were built as large residential mansions. One example of this transformation exists at 1611-17 Connecticut Avenue, the home to the Anne Taylor Loft store, which was built as a private mansion by a wealthy widow from California. 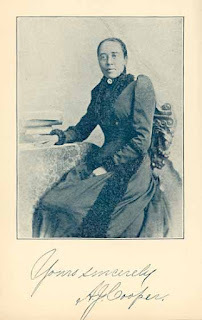 Ellen Mason White Colton obtained a building permit for the house on October 16, 1895, which was designed by local architect Carl B. Keferstein and built at a cost of $40,000, at a time when the typical Washington townhouse was built for $2,500 or less. She was the widow of David Douty Colton (1831-1878), who had amassed a fortune from the gold mines of California and Western railroads. He was described as standing over 6 feet tall with a muscular physique and a head of fiery red hair that went well with his bold and expressive temperament. David Colton had been born in Maine on July 17, 1831, and migrated with his family to Illinois, where he married Ellen Mason White during his freshman year at Knox Manual Labor College. 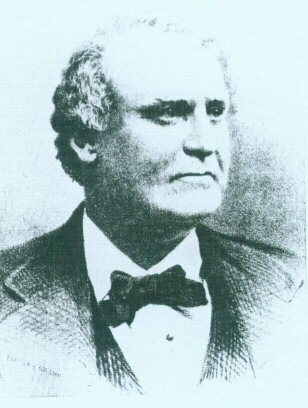 In the spring of 1850, the Colton’s and a friend named Hiram G. Ferris dropped out of college and joined the gold rush to California, where they eventually settled into Shasta City and Colton was elected as their sheriff at the young age of 20. They had two children; Helen in 1854, and Carrie in 1856, who would die shortly after she was married. Pressed Brick or Not Pressed Brick, That is the Question. Many people with a brick house might not notice that the bricks utilized on the front facade differ from those found on party walls or even exposed exterior side walls. 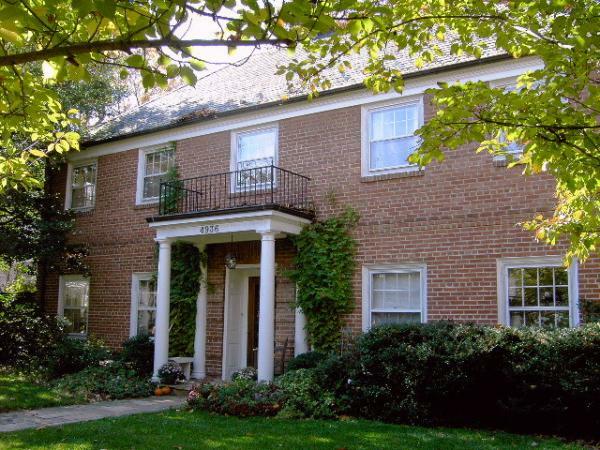 The street elevation of most Washington, DC townhouses was often listed on the building permit as being composed of pressed brick, which was a more expensive and aesthetically pleasing finish than the simpler, cheaper common brick. 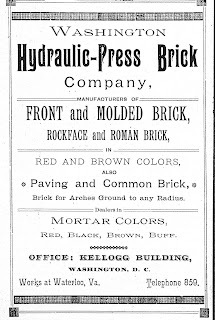 Common bricks produced in and around the District at the time of construction were generally uniform in shape and color; however, their crude manner of production often resulted in rounded edges that required larger and somewhat irregular mortar joints. Pressed bricks had sharper edges and could sustain smaller, thinner mortar applications. Since these pressed bricks required more refined production techniques and a higher degree of skilled labor, their purchase and installation was obviously more expensive. Thus, they were generally used for the most important elevation of a home. 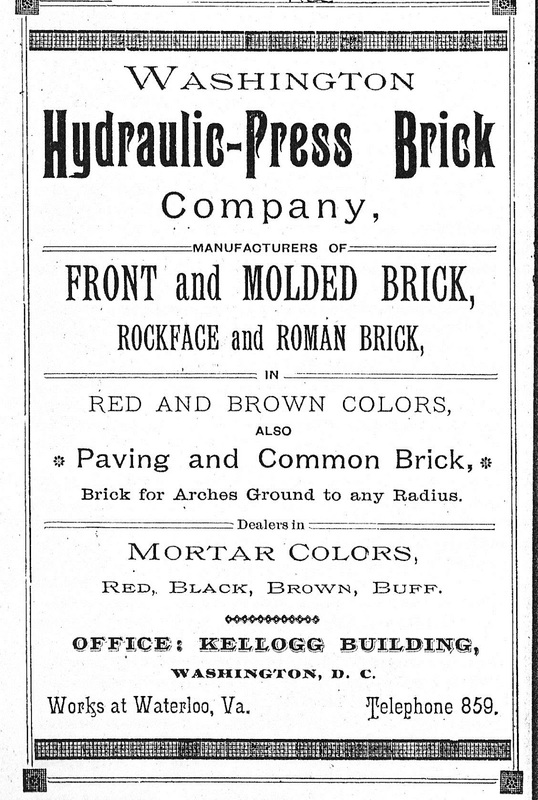 The 1891 advertisement for the Washington Hydraulic Press Brick Company appears above.